Rosie is 11 years old and has been playing the harp for three years. She is about to sit her grade 8 on the pedal harp and grade 7 on the piano. Rosie won a principle conductor and music director scholarship with the national childrens orchestra and has won minns young musician of the year. 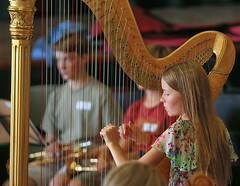 Rosie enjoys her lessons with Eluned Pierce and loves playing the harp for weddings at the Chewton Glen hotel.